The Seattle Department of Transportation (SDOT) will close one southbound lane on the Dr. Jose Rizal Bridge at the north end of Beacon Hill today from 9:00 am to 3:00 pm. The closure is required to allow engineers to perform a routine inspection of the bridge. This closure may be rescheduled, however, if crews are called on do emergency work elsewhere. SDOT has substantially completed the rehab project on the bridge. The project was necessary to extend the life of the bridge, built in 1911, and reduce the frequency of major maintenance and repair. The bridge is the state’s oldest steel arch bridge, and is on the National Register of Historic Places. The rehabilitation project included repairing concrete spallings on the bridge deck, installing a new sidewalk concrete overlay, repairing and sealing cracks in the concrete, and repairing or replacing deteriorating expansion joints and a concrete girder. 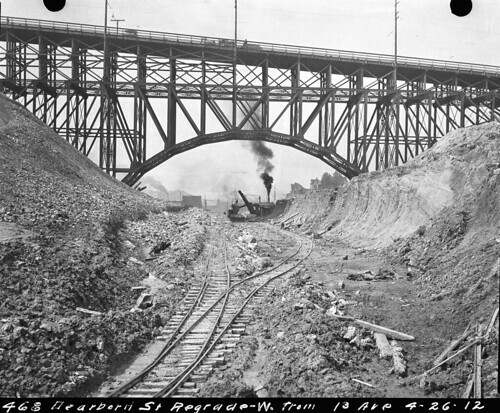 A view of the Rizal bridge from the Dearborn Street regrade in 1912. Yes, the angle of the bridge at the south end was steeper then than it is today. A 1917 mudslide along with some regrading on Beacon Hill required the southern approach to be rebuilt, this time less steeply. Photo courtesy of Seattle Municipal Archives.